Harry Burt, the Youngstown confectionery who strived to make the most delicious candy and ice cream, created the treat, patented the process of production and the machinery for its making, and created the unusual system for its distribution. In downtown Youngstown between 1893 and 1922, Harry B. Burt (1875-1926) worked as a confectioner who produced candy, then added ice cream, soda fountain and grill to his store, expanding his business to include a bakery and restaurant, finally adding twelve refrigerator trucks to distribute Good Humor bars to Mahoning Valley and Youngstown city neighborhoods. All these successes he accomplished during the decades of Youngstown’s greatest social, commercial and industrial expansion. Burt came to Youngstown in 1893 when he was eighteen. He opened a penny candy store on South Hazel Street in a tiny, wood frame building, two long blocks from Market Street and one block south of Federal Street, the two main streets of the city. A Youngstown Vindicator editorial eulogizing Burt recalled that this first candy store had no floor covering, faded paper on the walls, almost no furnishings, but “it was so clean—an exception for a confectionery in those days—and everything he sold was so delicious.” Burt’s business grew enough that he could afford to move one block east, in 1895, closer to the center of commerce, where he occupied a corner store facing both Phelps and West Boardman Streets. Here his best customers where the children who attended Front Street Elementary School, one block to the south. At this time, his confectionery still produced mainly penny candies. In 1897, the business moved two blocks north to 27 North Phelps Street where the confectionery occupied a new building facing the street. The candy workroom was in the old wood-frame post office building that had been moved back from the street to accommodate the new candy sales room. This confectionery was the first to produce “old fashioned chocolate cream drops”. In 1898, the business added a “soda fountain”, the first such restaurant in Youngstown. 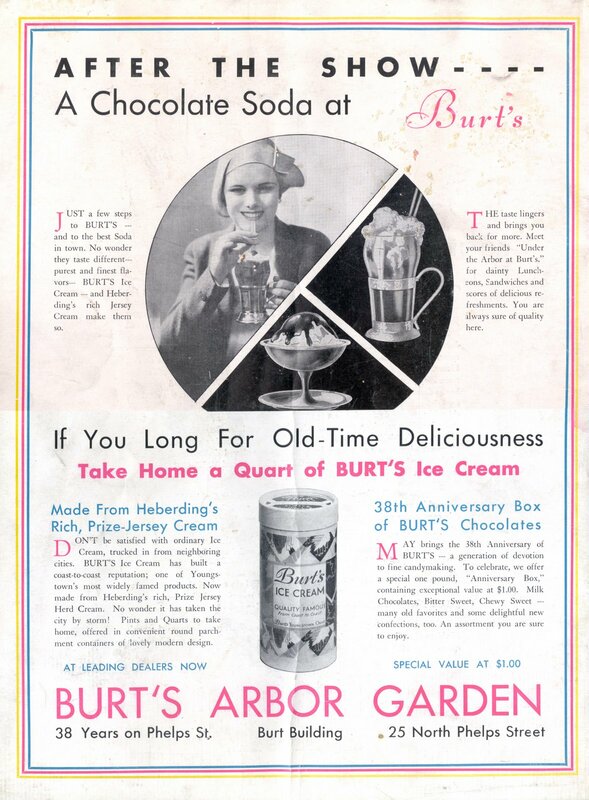 In March of 1902, Burt moved his confectionery one door north, to 29 North Phelps, were its new restaurant was called the “Arbor Garden at Burt’s”, a name that continued in each new Burt confectionery. In 1906, the restaurant was remodeled with “a Mexican onyx soda fountain with German silver trim,” noted in an August Youngstown Vindicator article. 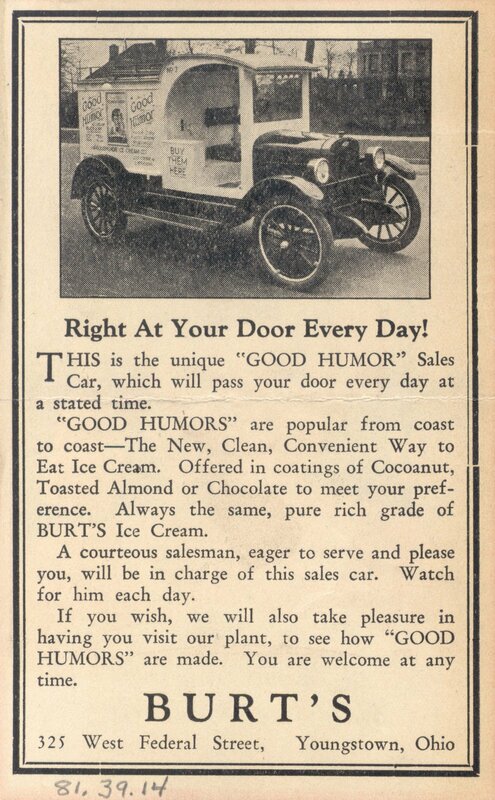 In 1920 or 1921, Burt developed a smooth chocolate coating that was compatible with ice cream. His children helping, he experimented with coating a cut portion of ice cream with the new chocolate. His daughter Ruth said the ice cream bar was “messy.” The solution, suggested by son Harry, was to add a wooden stick, as if the product was a lollypop candy. Burt called the new ice cream product “a new clean convenient way to eat ice cream.” The name for the new chocolate-coated ice cream bar, “Good Humor”, alluded to the nineteenth century belief that a person’s humor or temperament was related to a person’s sense of taste, or the “humor” of the palate (icecreamusa.com/good_humor/history). Before opening the new three-story store and factory, on January 30, 1922, Harry Burt applied for a patent for the machinery to produce the “Good Humor” sucker and for the production process. He received the patent October 9, 1923 (MVHS archives, patent documents). When the Burt’s West Federal Street store opened on April 3,1922, The Vindicator dedicated two front-page photos and most of an inside page to “A great addition to W. Federal Street’s new shopping district” (Vindicator, 4.3.22). 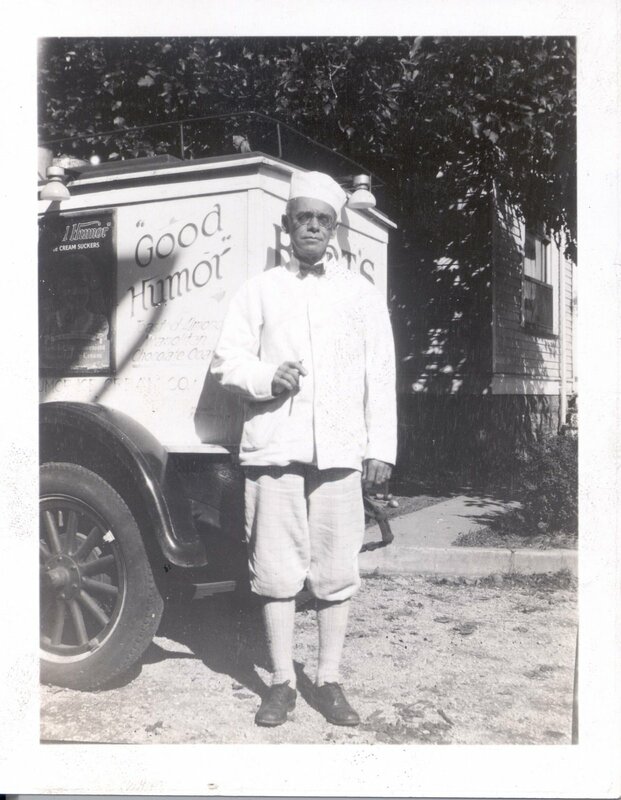 Between 1922 and 1926, the availability and popularity of the Good Humor ice cream bar grew through production at the factory in the new building and through the fleet of refrigerator trucks. Burt utilized two of the flavors of ice cream in the “Good Humor suckers” that he sold in his ice cream parlor, vanilla and chocolate. All Burt ice cream, including Good Humor bars, had a high cream content, 25% butter fat (souvenir booklet). Later newspaper descriptions specifically note that the chocolate coating contained no wax (Vindicator, 4.27.28). According to Jefferson Moak, “At a time when standardization was unknown, Burt wanted a standardized product with the same ingredients” that would retain the same favor in every sales market. Burt’s marketing plan was to license manufacturers for all new markets (Moak). To protect the quality, Burt filed lawsuits with his chief competitors, the producers of popsicles. Much of Moak’s details of the business history of frozen suckers came from testimony for these lawsuits. After Harry Burt died in 1926, his wife Cora took the company public, selling franchises for $100 (icecreamusa.com). In 1928, Cora sold the business and patents to Good Humor Corporation of America. The new owner planned to advertise widely and nationally market the “Good Humor Sucker” (Vindicator, 4.27.28). At that time, Cora Burt reserved the rights to manufacture and market the product in Youngstown and the Mahoning Valley. However, the following year, the West Federal Street ice cream production and restaurants closed. 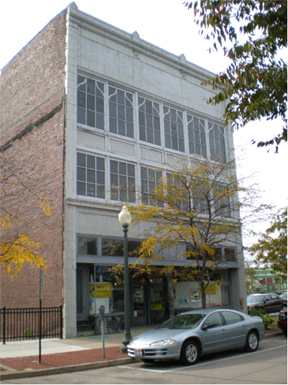 Ruth Burt’s husband Paul Bolton purchased the candy making equipment and recipes and ownership of the 29 North Phelps Street store where he planned to continue production with a nation distribution (Vindicator, 2.7.29).In 1930, a New York businessman and investor by the name of M.J. Meehan acquired the national rights to the company by buying 75 percent of the shares. The Meehan family owned the company until 1961 when it was sold to Unilever’s U.S. subsidiary, the Thomas J. Lipton Company. Unilever’s Lipton Foods unit continued to manufacture and market Good Humor® products for the next 12 years. In 1976, when the company’s direct-selling business was disbanded in favor of grocery stores and free-standing freezer cabinets, the trucks were parked for the last time. Some of the trucks were purchased by ice cream distributors while others were sold to private individuals. In 1989, Unilever purchased Gold Bond Ice Cream, located in Green Bay, Wis., and grouped its U.S. ice cream and frozen novelty businesses under the name Gold Bond-Good Humor Ice Cream. With its acquisition of Breyers® Ice Cream in 1993, the company name was changed to Good Humor-Breyers® Ice Cream.